Anyone else went to the Surrey Fusion Fest over the summer? It was held over the weekend of July 16-17 and it’s basically a mini world cuisine/cultural event that included many food stalls and cultural presentations such as Korean drumming, belly-dancing, etc. The big-ticket event was the 9pm show Sunday night featuring Jay Sean. Bedouin Soundclash was featured the night before. One of my favorites was definitely the El Salvador stall. 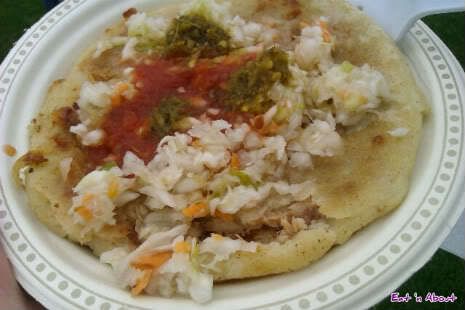 I went to the fest with Hitman and he actually recommended me try what’s called a pupusa, which is a traditional Salvadorean dish of handmade corn tortillas stuffed with various ingredients. At this stall they offered either meat, cheese, or mix. On my first try I tried the mix. It was crumbly but very flavorful and savory. I’m actually not sure what meat is in it but it was a ground meat of some sort. The homemade salsas were pretty spicy though, especially the green stuff. I enjoyed this so much we went back the next day and I had another one. 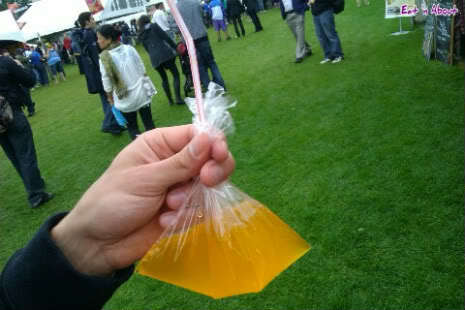 No this is not urine in a bag. At the same stall I also got an import mango soda. I actually wanted the mango juice but a miscommunication between Hitman and I and the guy resulted in the soda version. It was interestingly served in a little flimsy plastic bag with a straw. Actually I had to ask for the straw LOL. Actually now that I think about it, what I REALLY wanted was the Tamarind juice but again…miscommunication…. 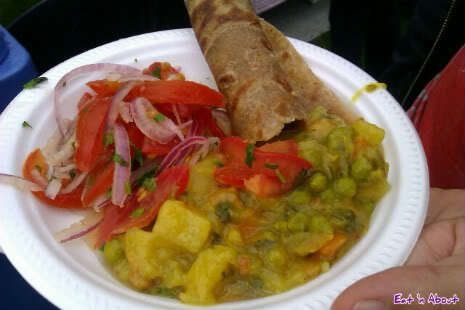 Hitman visited the Kenyan stall next and got a platter of curry plus a tortilla of some sort. I tried a little and it really wasn’t that good. The tortilla was premade and kept warm so it was a bit dry. As for the curry, let’s just say I still prefer Indian/HK versions much, much more. We actually tried more food the next day but the weather was just so damn miserable I didn’t take any pictures. I did recall trying momo’s from the Tibetan stall, got Hitman to try some “Fries” from the Taiwan stall which really were deep-fried fish cake (‘tempura’) and Salt & Pepper Chicken nuggets. All-in-all it was a nice event for spending a weekend on.